All well and good, I'm fine with that...except it doesn't really work for when it's the same character/s, eh? Turtletrekker and cooleddie74 like this. Mary Chieffo said in The Ready Room that they still put on the full season 1 "cowl" and then on top of that a separate wig that is sewn on to keep it in place. So the big head is supposedly still there under all that hair. The video in Tuskin38's post above shows a side-by-side comparison. She no longer has the "Kingdom of the Crystal Skull" elongated cranium like in S1. Though some of the other Klingons in the episode still had longer skulls. L'rells was the most drastic change. The war excuse doesn't stand up to much scrutiny. ...And thankfully it was not quite given in "Point of Light". The quip about the hair, "postwar", could mean just about anything. 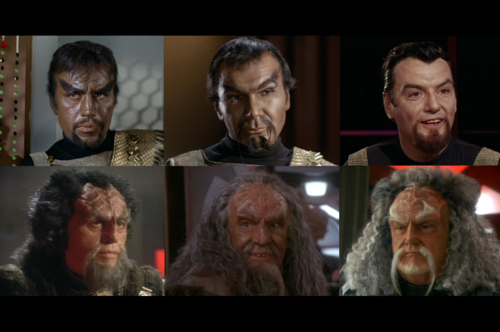 Every single Klingon in season one is bald, including flashbacks and alternate universes. But I really say fashion. Which, since this is the future, extends to skulls. What about all the representatives he talked to over the holocom? They were all bald, and they didn’t seem to like him very much. Could be because most of the Houses were fighting each other. The civil war might also be the reason why there is a orion embassy on Qo'NoS. There is no central government at the time of the war and the Orions are also dealing with weapons, the houses might by. Hythlodeus and Tuskin38 like this. Well in TNG we know that the Homeworld appears to be neutral ground. Remember during the Civil War the different factions were drinking with each other. Apparently it could have been the same way during "Will You Take My Hand". All kind of Klingons, belonging to different houses, drinking and amusing themselves together at the orion embassy. cooleddie74, Hythlodeus and fireproof78 like this. The one Starfleet Captain to earn such awe and respect from the Klingons. 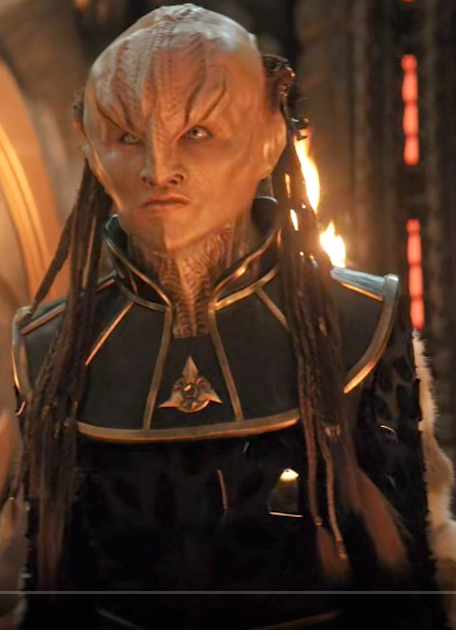 Admiral Robau needs to show up on DSC. I'm just saying. You know I'm right. Phoenix219, JoeP, XCV330 and 2 others like this. the fact that his name wasn't on Saru's list of greatest captain's was wrong. People complaining about a D7 with some extra gold leaf and rebar braised on for bling but Robau isn't on the captain's list. pst, JoeP, Hythlodeus and 2 others like this. The query was actually "Greatest Captains other than Richard Robau who needs no introduction." But, I agree, it is a grave oversight. Hopefully Saru gets to meet Admiral Robau and make up for the exclusion. JoeP, XCV330 and cooleddie74 like this. I just realized that the actor who played Robau also played the Ten Rings terrorist Raza in the first Iron Man movie. Yeeep. He also appeared in Alias and Lost, both JJ Abrams productions. JoeP and cooleddie74 like this. Well, Robau was defeated by Nero. The actor who played Nero once played the Hulk. Tony Stark defeated the Hulk in Age of Ultron. It still works.